As bad as the European debt crisis has been for stocks here at home, the equity carnage across the Atlantic has been so much worse. The flight to safety that's pushing up the dollar and crushing the euro might have U.S. stocks in correction mode, but over in the European Union they're in a full-on bear market. The MSCI EU Index, a broad measure of share performance for the region, is off nearly 25% after topping out way back in January. 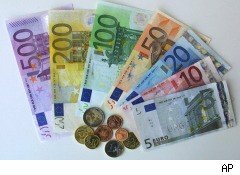 By the same token that a strong dollar is bad for U.S. exports, a weak euro could be a boon for multinationals exporting goods out of the currency zone. Just take a look at Monday's report showing that eurozone exports jumped last month, led by the surging German industrial sector. As European markets sell off indiscriminately, there's likely some bargain stocks to be found overseas -- especially among companies with lots of international revenue. With that in mind, we screened for beaten-down, big-cap multinationals in the eurozone (trading as American Depositary Receipts, or ADRs, on major U.S. exchanges) that should benefit from currency weakness. 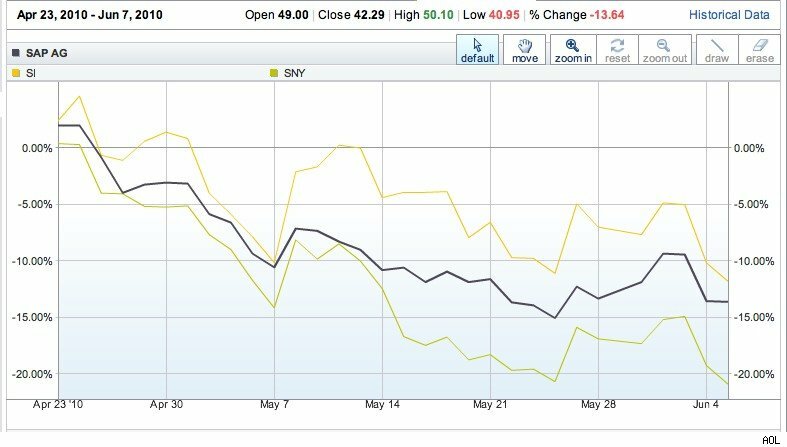 Two are from Germany and one is from France and, by coincidence, they all begin with the letter S.
SAP (SAP), Siemens (SI) and Sanofi-Aventis (SNY) are off anywhere from 12% to 22%, respectively, since the S&P 500 ($INX) topped out on April 23 (see chart below.) Although the short-term outlook for equities is volatile and grim, farther out these three stocks appear compellingly priced at current levels. SAP, the software-as-a-service giant and Oracle's (ORCL) chief rival, derives about 75% of its revenue from outside Germany -- and is hungry for more big acquisitions, its co-CEO said Tuesday. Meanwhile, shares should outperform the broader market over the next 12 months, seeing as they're currently trading at a 16% discount to their fair value, according to an analysis by ValuEngine. Siemens, the mega-conglomerate that's essentially the General Electric (GE) of Germany, derives about 40% of its revenue from outside Europe. Analysts' average price target stands at $96, according to data from Thomson Reuters. Add in the dividend yield and you get an implied upside of more than 11% in the next year or so. French pharmaceutical giant Sanofi-Aventis (SNY) has been so beaten down that ValuEngine put a strong buy call on the stock last month, reckoning that shares are on sale to the tune of about 25%. Wall Street analysts are even more bullish on the stock, with an average 12-month price target of $43. Add in the copious 4.2% yield on the dividend, and the implied upside comes to nearly 55%.